I am a deep ecologist. I was raised in a family with strong land conservation values. We hiked, camped, hunted and fished. I have carried those values into my adult life, both personally and professionally. I was a founding partner and am the continuing Project Manager of Valley Floor Preservation Partners and served as the executive director of Sheep Mountain Alliance from 2007 to 2015. After working full time as an advocate for environmental issues in southwest Colorado, most notably our efforts in the west end of San Miguel and Montrose Counties, I want to engage in a more productive dialogue with the west end communities of our watershed. After developing a deeper understanding of our middle and lower watershed, I see opportunities to work together, while still respecting our cultural and historical differences. 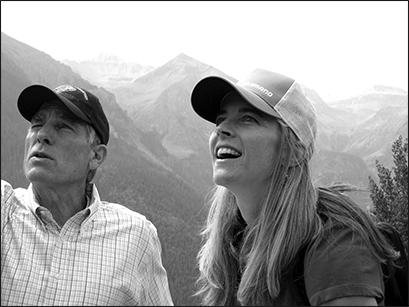 Touring the proposed wilderness with Senator Udall in 2013. We must come together as communities and public land managers of the San Miguel Watershed to find solutions to preserve the lifeblood that connects us—the river—and support our communities economically into the future. Our economy and our environment are connected, and both benefit from us working together. Building the Payment for Ecosystem Services program to establish financial incentives for landowners who protect and improve water, soil and habitat conditions. Coordinating with public land managers to protect our natural resources and develop more recreation, cultural heritage and other economically beneficial opportunities throughout the county. Participating in the multiple public lands planning processes anticipated in the next few years. Creating more effective energy and fossil fuel reduction incentives for building and transportation in the County.